The life of Harold E. Goeke will be celebrated at 2:00 PM, Sunday, April 14, 2019, at First Presbyterian Church of Litchfield. Plummer Funeral Home is in charge of arrangements. There is no visitation. Private interment will be in Elmwood Cemetery. 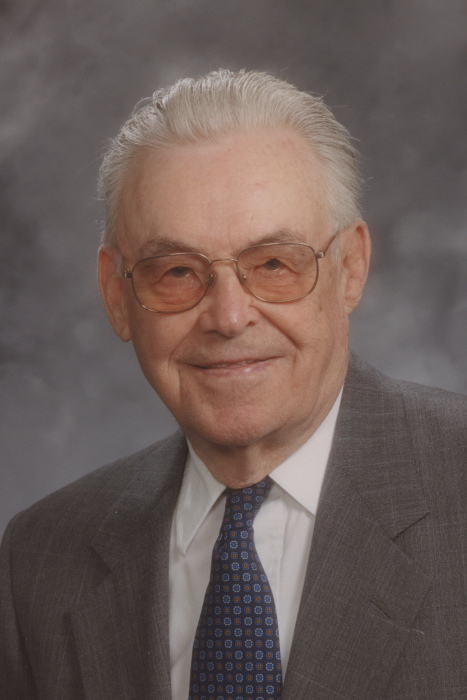 Mr. Goeke, of Zanesville Township, passed away peacefully in his home January 14th. He was 102 ½. The Goekes began farming in 1950 and also had a Jersey dairy herd. They were co-leaders of the Harvesters 4-H Club, and Harold served on the Montgomery County 4-H committee. Harold was school board president for New Hope School District #7 that built New Hope School and then became part of Litchfield District #12. He served on the Litchfield School Board, and, for a time, belonged to Litchfield Rotary. He also belonged to the American Legion. Harold taught physics and science at Litchfield Junior and Senior High Schools and provided photographic support for the LICOHI yearbook. He retired in 1976. An ordained elder, Harold served multiple terms on Session and as Clerk of Session of First Presbyterian Church of Litchfield. He was on the Building Construction Committee for the present facility. Harold was born July 18, 1916, in Moline, IL, son of Otto and Ada Sarsfield Goeke, and spent his youth in Dixon, IL. He was an Eagle Scout and high school co-valedictorian. He earned a B.S. in civil engineering from the University of Illinois, Urbana. As Cadet Colonel, he led the campus Reserve Officer Training Corps. Also, he edited The Illinois Technograph, the student engineering journal, and belonged to the American Society of Civil Engineers; Tau Beta Pi and Chi Epsilon honoraries; and Sigma Pi fraternity. Harold married Esther Stuttle of Litchfield in 1939. She passed away in 1998. They lived in Pittsburgh, PA, Dayton and Cleveland, OH, and New York City areas during Harold’s pre- and post-military civil engineer work at the Aluminum Company of America. There Harold supported the Army Air Corps WWII effort. On active duty, he attended the Army Corps of Engineers School and served as an Army engineer officer in Europe. Photography and woodworking were lifelong hobbies. Survivors include a daughter, Mary Wilde (Robert); a son, Joseph Goeke; grandchildren Diane Wilde Christopher, James Wilde (Anne), Susan Lee (Jay); great-grandchildren Katrina, Alan, Clara, Carson, Julia, and Parker; and brother-in-law, Donald Schaal. His sister, Dorothy Schaal, and daughter-in-law, Joyce Goeke, preceded him in death. In lieu of flowers, memorials may be directed to the First Presbyterian Church or a favorite charity.